Company History | Newark Wire Works Inc. Producing wire mesh partitions for armories around northern New Jersey to secure arms and vehicles. Manufacturing and installing wire mesh partitions for bank enclosures to separate money counters. Manufacturing and installing wire mesh partitions for offices to separate accounting work stations. Manufacturing and installing window guards for a majority of northern New Jersey public school districts, with our highest concentration in Newark and Jersey City. 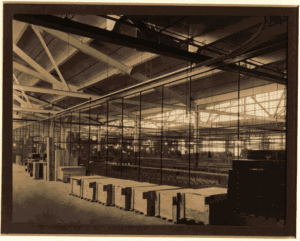 In the early 1910’s and 20’s, we manufactured and installed wire mesh partitions for power plants, train stations, and bus terminals. These original guards are still in place, demonstrating our testament to quality and product durability. Contracting for the National Parks Service in 1986, for the restoration of the Statue of Liberty and updating elevator shafts on Ellis Island. 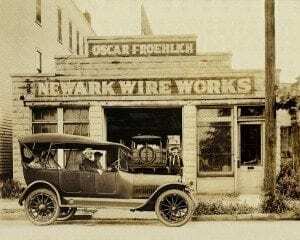 Newark Wire Works Inc. was established in 1910, by Oscar Froehlich. Shortly after establishing the company, he partnered with his son, Oscar Jr., and his son-in-law, Walter. Together they acquired a small building, approximately 2000 sq. ft., located on South 14th Street in Newark, New Jersey. They continued their partnership for over fifty years. In 1960, George Klacik, owner of Eagle wire and Brass, purchased Newark wire Works and merged the two companies. Some of Mr. Klacik’s contributions to the company include purchasing and consolidating Industrial Wire Works and Acme Wire Works, expanding the existing building to a 13,000 sq. ft. facility, and successfully running the company for over 20 years. In 1982, Joseph L. Spellman purchased Newark Wire Works Inc. and five years later it was taken over by his son, Joseph P. Spellman. As the business continued to grow, there was a clear need for a larger facility. As a result, in 1999, JP and his wife/ co-owner of the company, JoAnn Spellman, relocated to a large state of the art facility in Edison, New Jersey. This present day facility is fully equipped for modern fabricating and stocking a large inventory of wire mesh material. In 2009, a third generation of the Spellman Family joined the company. Michael Spellman is the Vice President of Sales and Chris Spellman is the Plant Manager. 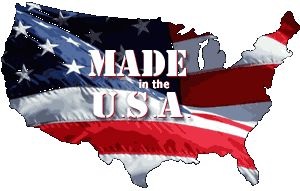 Together, the Spellman family takes pride in their top of the line customer service and quality products. Today, Newark Wire Works is one of the leading manufacturers and suppliers in a wide range of wire mesh partition needs.